One of the hardest tricks to pull off in animation is to give inanimate and inhuman objects recognisable quirks, traits and characteristics. Gumball Wars by Scott Thierauf succeeds in spades. The two gumball machines have very distinct personalities and Thierauf uses them to great effect in this mini masterpiece. 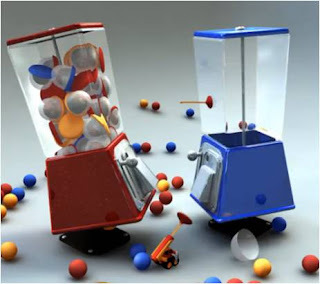 It is very funny too – I just love the way the blue gumball machine snickers! If this little story has any moral it is perhaps that patience has its own rewards.